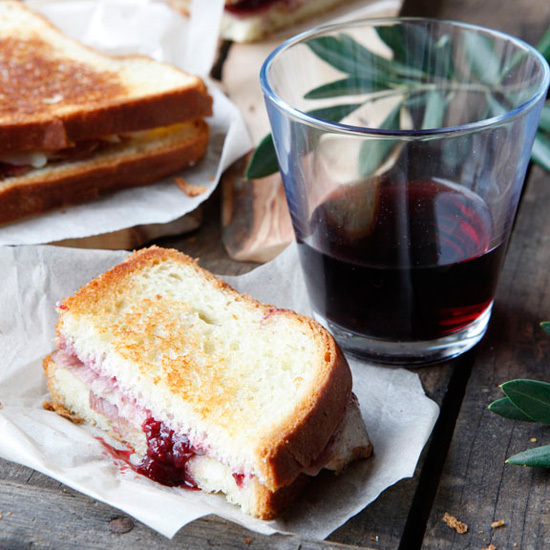 Red wine is fantastic for more than just drinking. 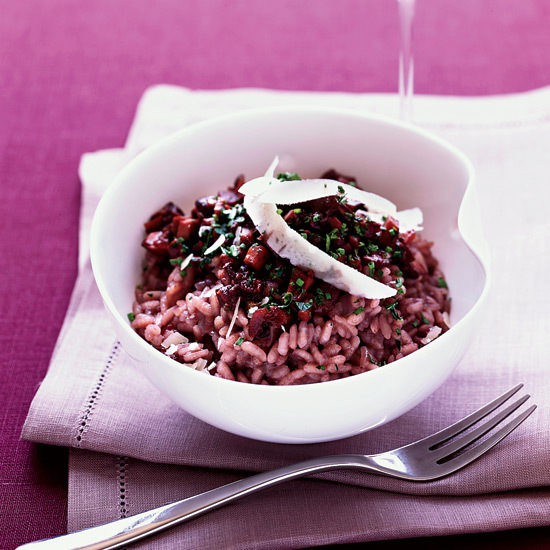 Here, incredible recipes that use red wine including rich stews and amazing sauces. 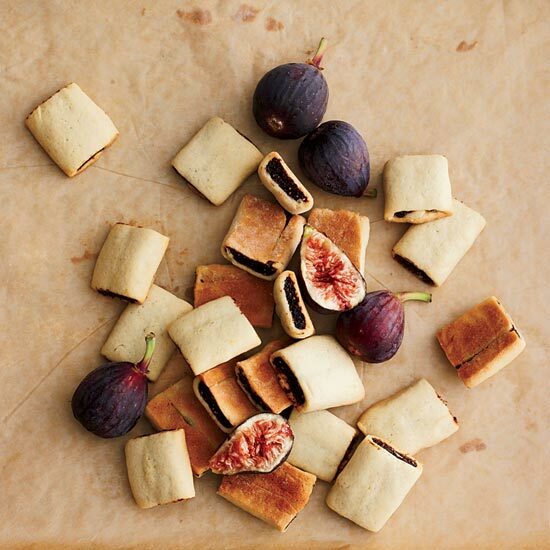 This recipe, adapted from pastry chef Gina DePalma, is truly greater than the sum of its parts. 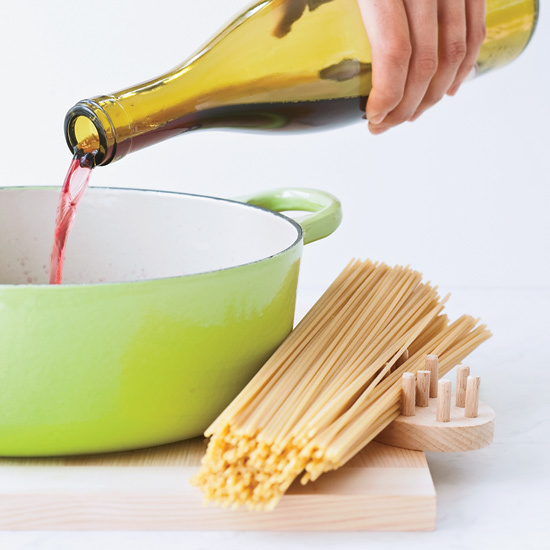 Who knew that basic dried pasta, simply boiled in red wine, could develop such complex flavor? 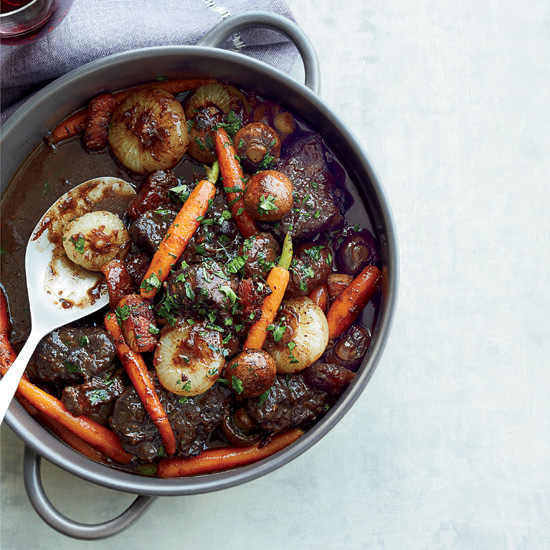 To layer the flavors in this dish, chef Rory Herrmann marinates beef short ribs and vegetables in red wine overnight, then uses the marinade in the braise as well. 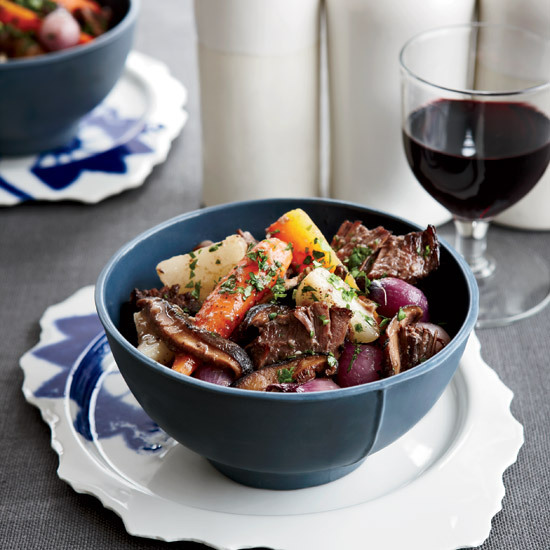 Spring vegetables help lighten the rich stew. 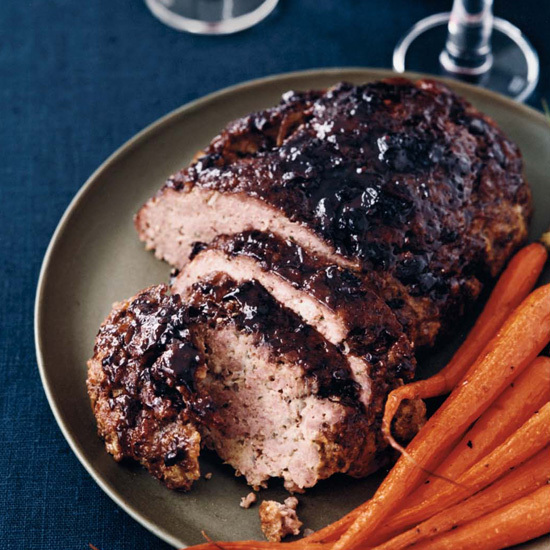 Shea Gallante brushes his meat loaf with a red wine glaze, which caramelizes as it bakes. 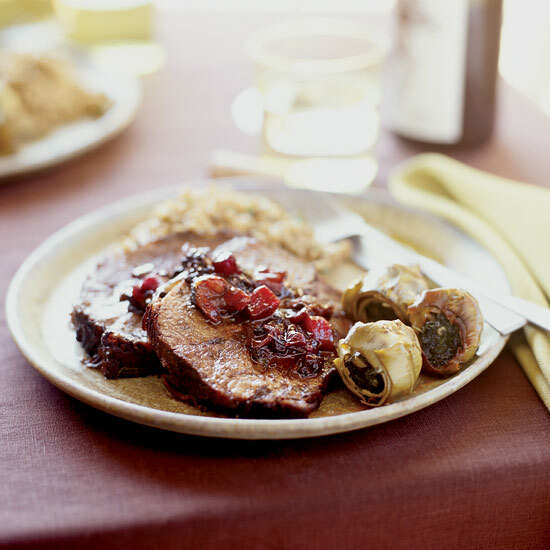 The glaze also makes the meat loaf especially easy to pair with red wine. 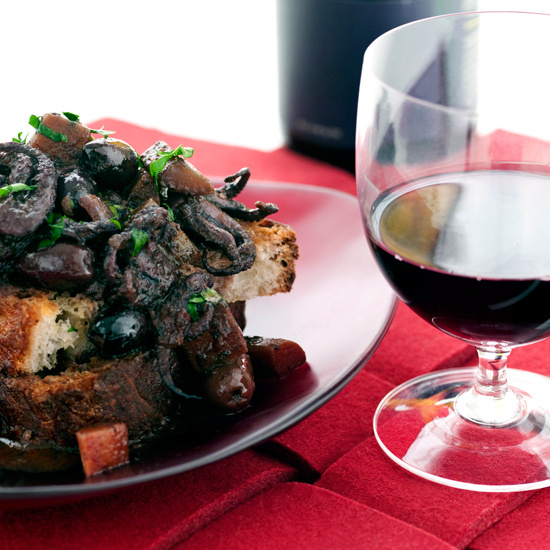 Meat loaf that isn't heavily seasoned can pair with almost any full-bodied red. 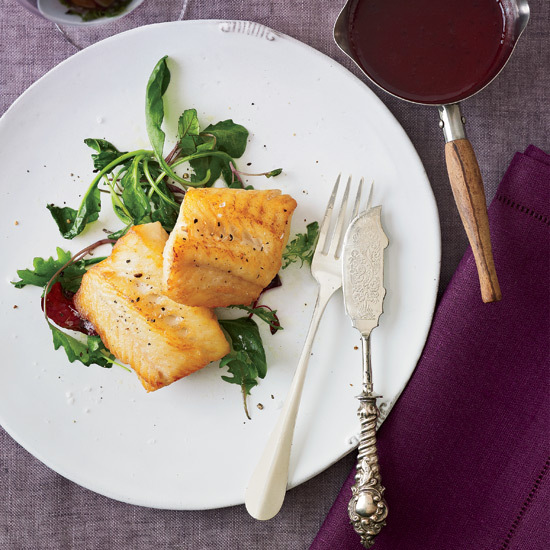 Try a firm Cabernet like a Chateau Ste. Michelle Columbia Valley. 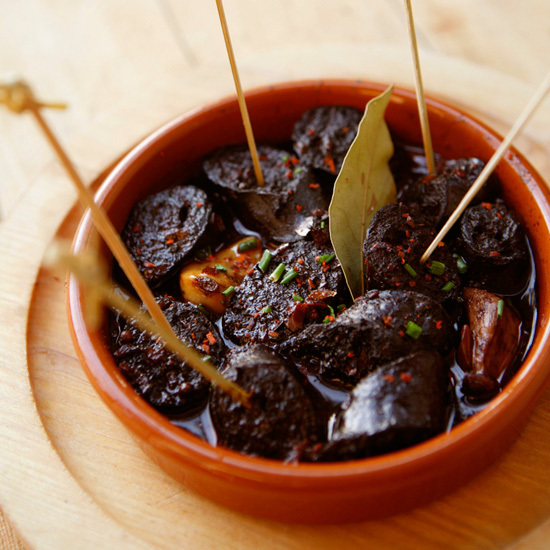 This smoky Spanish sausage with garlic is cooked gently in red wine until it's plump and juicy. The caramel, strawberries and mousse can be refrigerated separately for up to 3 days. Bring to room temperature before serving. Sophie Dahl fondly refers to this dish as Paris Mash because she used to make it in Paris while visiting an artist friend, Annie Morris. With herbs and a scattering of mâche (a sweet and tender green), the stewy lentils become a perfect combination of soup and salad. 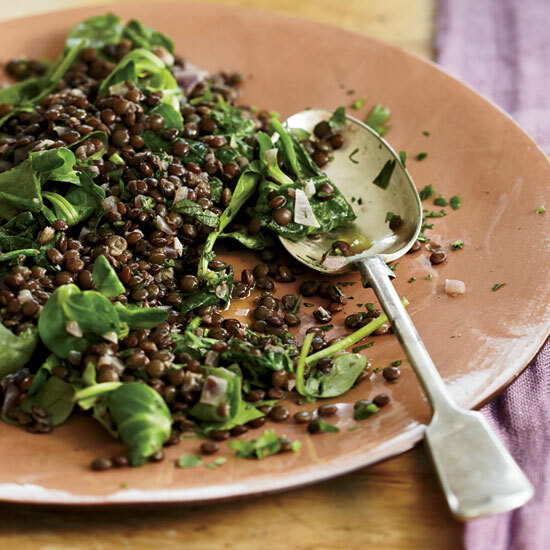 French green lentils work best here, because they hold their shape when cooked. 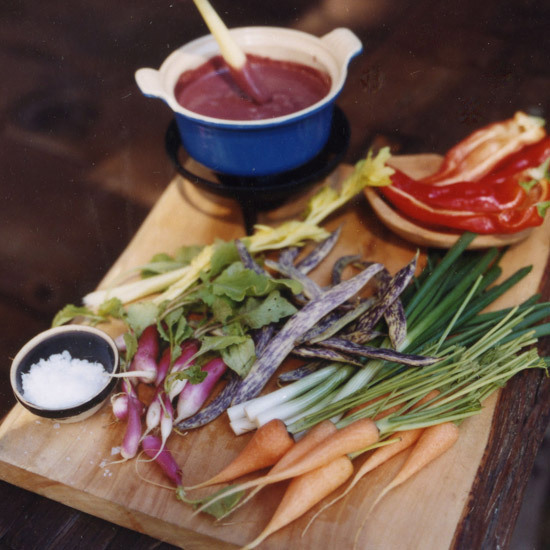 "A good sauce is the bridge between the meat and the wine," says Ken Frank. 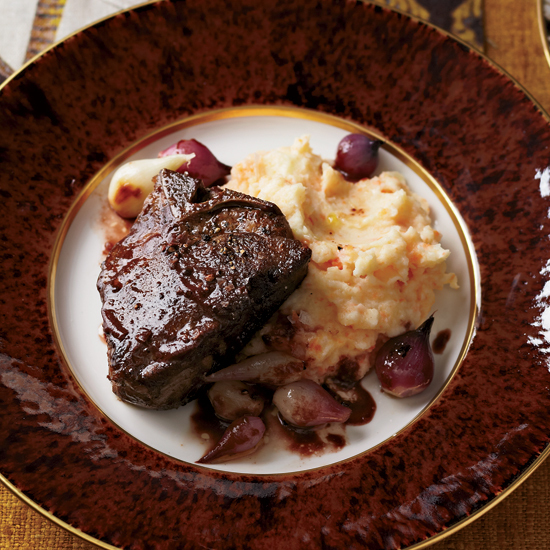 When pairing beef with Cabernet, he usually serves a hearty red-wine sauce, like the one on these short ribs. Veal stock gives the dish extra-deep flavor, but chicken stock (preferably homemade) works well too. 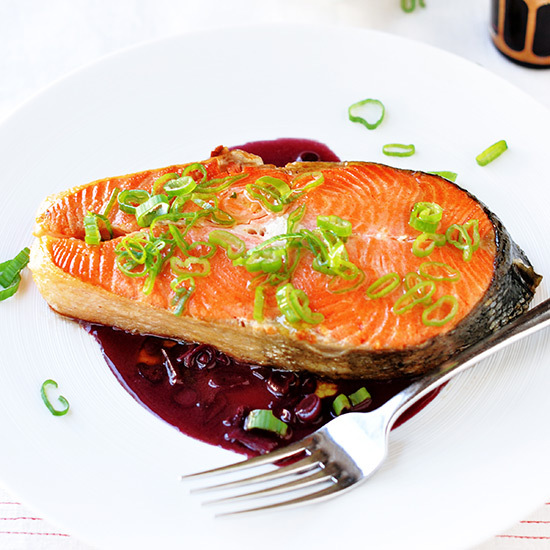 For this dish, chef Andy Arndt combines naturally fruity Pinot Noir with a bit of honey to make a lightly sweet sauce—a lovely accompaniment to these crispy-skinned duck breasts. 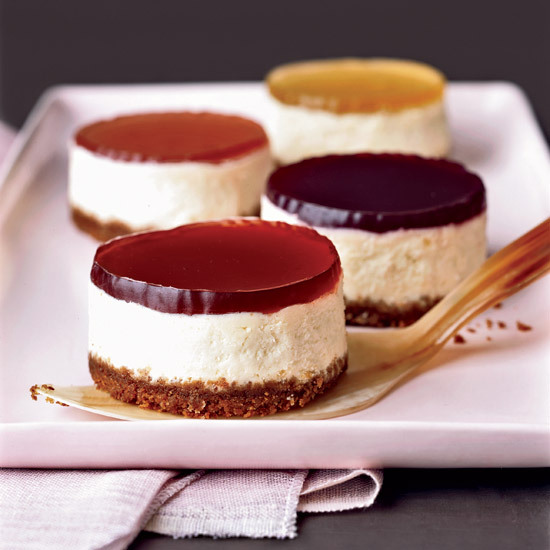 Pastry chef Kate Zuckerman thinks most cheesecakes are too heavy and sweet. 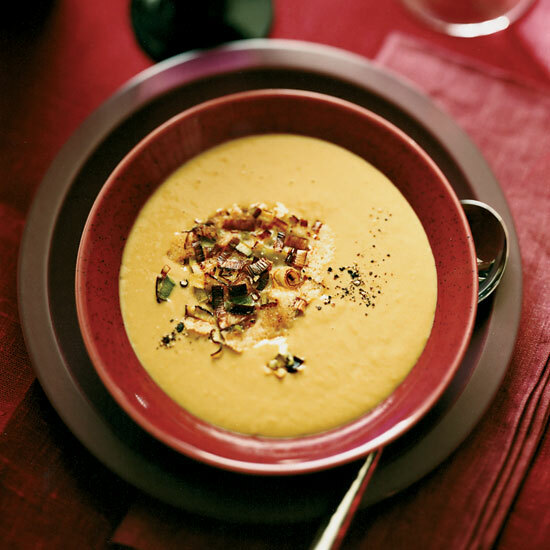 Her recipe uses goat cheese to lighten the texture and tangy crème fraîche to cut the sweetness. 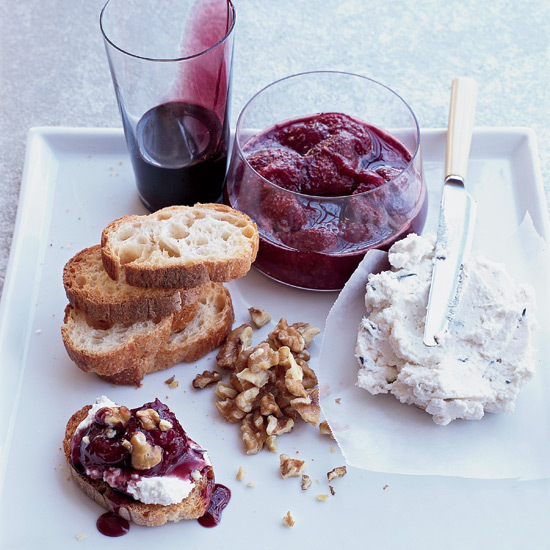 Here, she tops mini cheesecakes with wine gelées—a new kind of wine-and-cheese pairing. 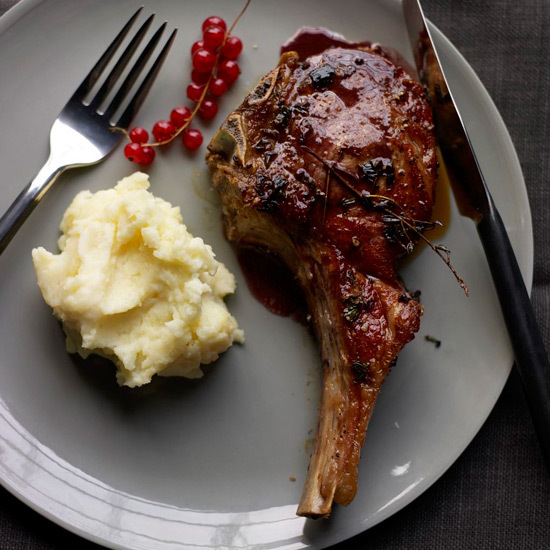 Ancho chile powder seasons these large lamb chops, which are topped with a great pan sauce made with beef broth, red wine and coffee. 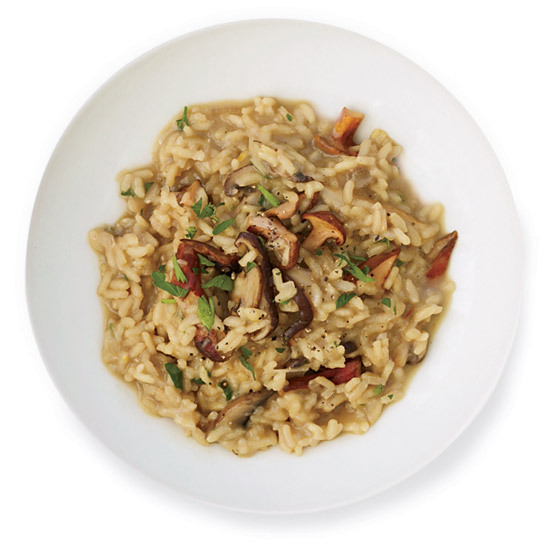 Two Japanese ingredients—white miso and soy sauce—add great depth of flavor to this lush and very French sauce, yet are barely identifiable. 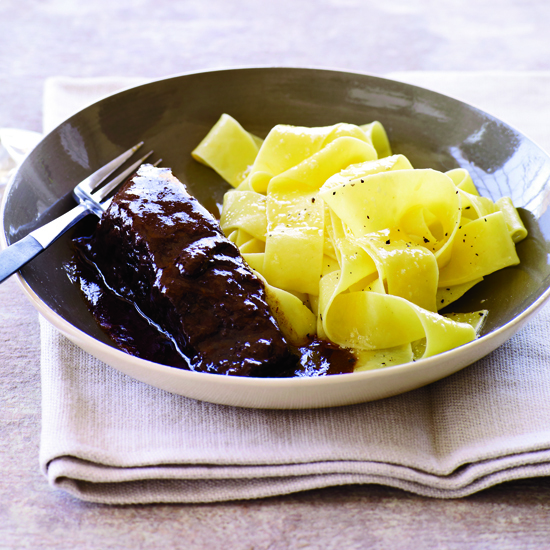 Peter Pastan loves the beef flatiron (or top blade) steak from the shoulder because it stays tender and flavorful after long braising, unlike the brisket or round roast, which can get stringy. 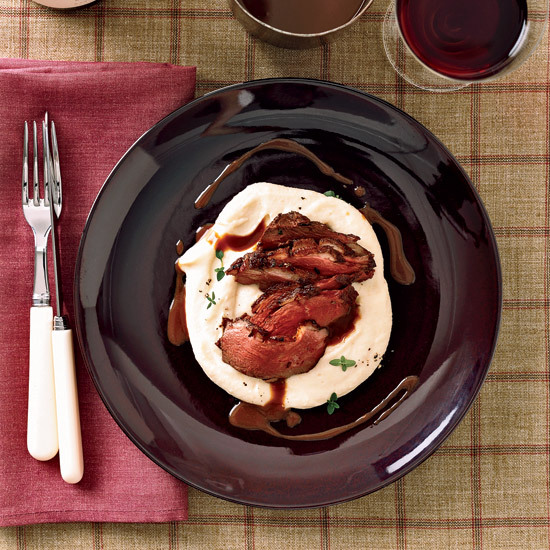 He likes to marinate the meat in just-picked and crushed Syrah grapes; in this recipe, table grapes work just as well. 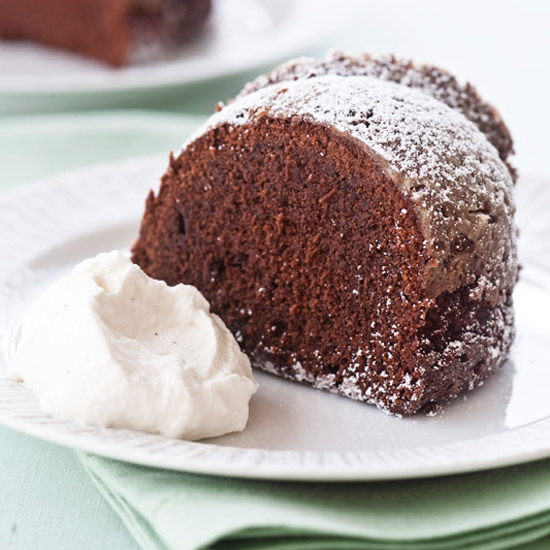 A recipe in Anne Willan's 2001 Cooking with Wine inspired this fluffy, not-too-sweet cake, which uses just enough wine in the batter to give it a slight boozy flavor. 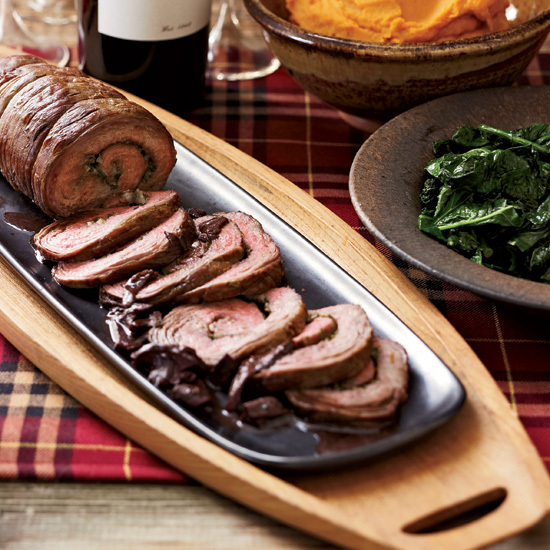 Mario Monticelli learned to make this stuffed steak from his mother. 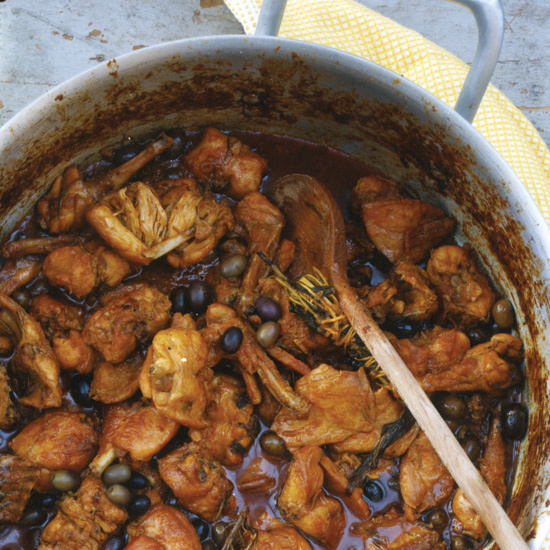 "This is one of my favorite things on the planet," says Marco Canora about his savory rabbit stew. 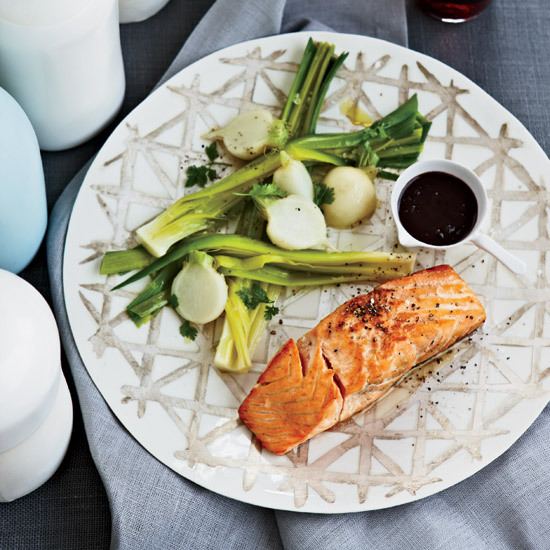 He loves sharing the recipe because it's an opportunity to teach people about making battuto (similar to soffrito), a mixture of sautéed onion, celery and carrots that's the base for many Italian dishes.